Waste material from the paper and pulp industry soon could be made into anything from tennis rackets to cars. "We have overcome one of the industry's most challenging issues by discovering how to make good quality carbon fiber from waste," said Dr. Joshua Yuan, Texas A&M AgriLife Research scientist and associate professor of plant pathology and microbiology in College Station. "People have been thinking about using lignin to make carbon fiber for many years, but achieving good quality has been an issue," Yuan said. About 50 million tons of lignin—or structural part of a plant—piles up each year as waste from the U.S. paper and pulping industry, he said. Additional lignin could come from biorefineries that use plants to produce ethanol, yielding another 100 million to 200 million tons of lignin waste each year. Yet only about 2 percent of the lignin waste is currently recycled into new products, Yuan said. "Lignin is considered as one of the most abundant biopolymers in the world," he said. "All this waste accumulates, and it will be great to use it for something." Yuan's research team has had several successes in making fuel and bioproducts from lignin. But even the biofuel making process leaves a large stockpile of waste. That led them to consider the possibility of making carbon fiber material. Carbon fiber is not a new concept. It has been toyed with since 1860—mostly for light bulbs originally—and is known for high strength, low weight and heat tolerance. "If you cannot produce quality carbon material, it's really not useful," Yuan said. "What we found is that lignin is a mixture of many molecules of many sizes and different chemical properties. 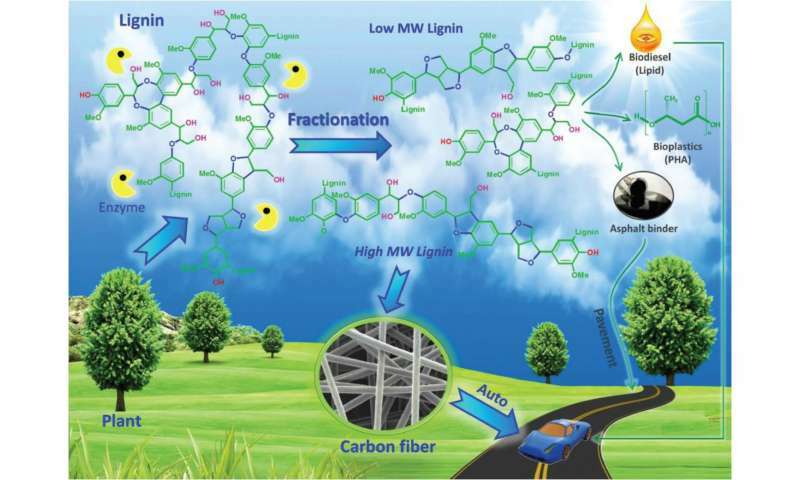 Through fractionation, we separated lignin into different parts, and then we found that certain parts of lignin are very good for high quality carbon fiber manufacturing," he explained. "We are still improving and fine-tuning the quality, but eventually this carbon fiber could be used for windmills, sport materials and even bicycles and cars," he said. "Carbon fiber is much lighter but has the same mechanical strength as other materials used for those products now. This material can be used for a lot of different applications. "The beauty of this technology is that it allows us to use lignin completely. Basically what we do is fractionate lignin so that the high molecular weight fraction can be used for carbon fiber and the low molecular weight fraction can be used use for bioplastics and products like asphalt binder modifier used on roads." Yuan envisions a multi-stream integrated biorefinery in which lignin is separated in one location so that a variety of materials—the high density carbon fibers and the low density bioplastics, along with biofuels from plant feedstock like grasses—could be made at one facility. "When we are able to use the same biomass to produce different things, that allows the best economic return by being sustainable," he said. "Eventually that would lead to increasing jobs and enhancing rural economic growth. "And the entire supply chain is in the United States, which means the jobs would be here. The biomass is grown, harvested and transported here. It would be difficult to ever ship that much waste to another country for production. It all stays here," Yuan said. "It would put agriculture production and industry together in a bioeconomy making renewable products." I've always thought that landfills were mines for the future. So Many Forest Fires Always. Think of Other Advantages Too! 1) Containing Pollution 2) Reduction of Financial Losses 3) Prevention of Animal Deaths, Particularly of the Herbivores!